Lt.Bettington, as a young officer serving with the Royal Artillery was fascinated by the possibilities which flying offered to his ‘trade’ regarding observation and recconaisance. He realized that the primitive aircraft of that era could offer a great step forward in this field. The Royal Flying Corps (RFC) was formed in May 1912 and after learning to fly, Lt. Bettington immediately transferred. Autumn army manoeuvers included the RFC for the first time. Eight aircraft were allotted, ‘four on each side’ and they were of several different types. No doubt Lt. Bettington was delighted to be paired with Edward Hochkiss, Chief Test Pilot for the Bristol Aircraft Co. and a Lt. in the Reserve, flying one of Bristol’s latest machines – a ‘Coanda’ Military Machine. Taking-off from Larkhill at 07.00hrs on 10th September 1912 they flew directly to Port Meadow, Oxfordshire which was the first stage. Arriving over Port Meadow at 2000ft the plane started to glide around the field preparatory to landing. Unfortunately a quick-release catch holding a strap opened and the strap fractured a flying wire which whipped about, tearing a hole in the starboard wing. 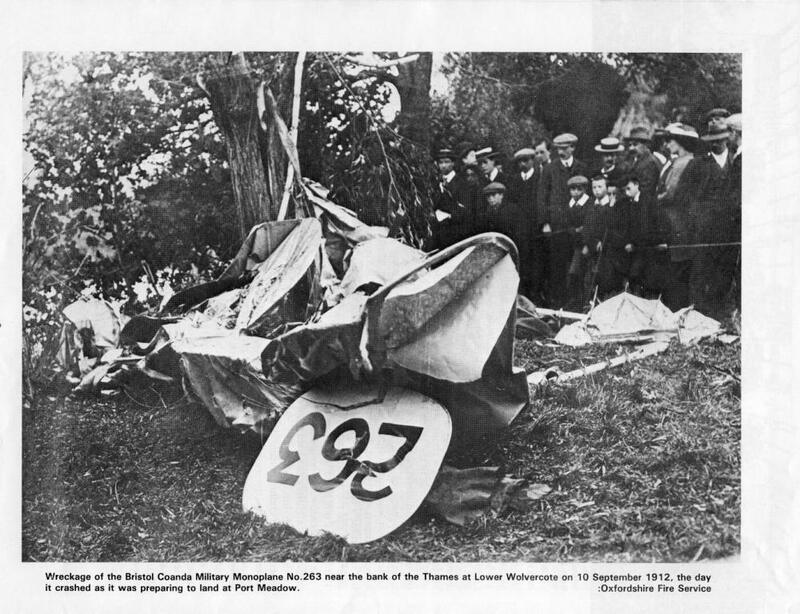 Fabric stripped off and control became impossible, the aircraft crashing to earth at Lower Wolvercote, 120 yards short of Port Meadow. Lt.Bettington was flung to his death from the aircraft and Lt.Hotchkiss perished in the ensuing impact. Huge sympathy was expressed in the village of Wolvercote and nearby Oxford from patriotic people who heard or saw the accident. 2225 citizens contributed to the erection of an inscribed memorial to be set into the stone wall nearest to the accident. This memorial is illuminated by an engraving of the aircraft they flew and is remarkable for its accuracy. 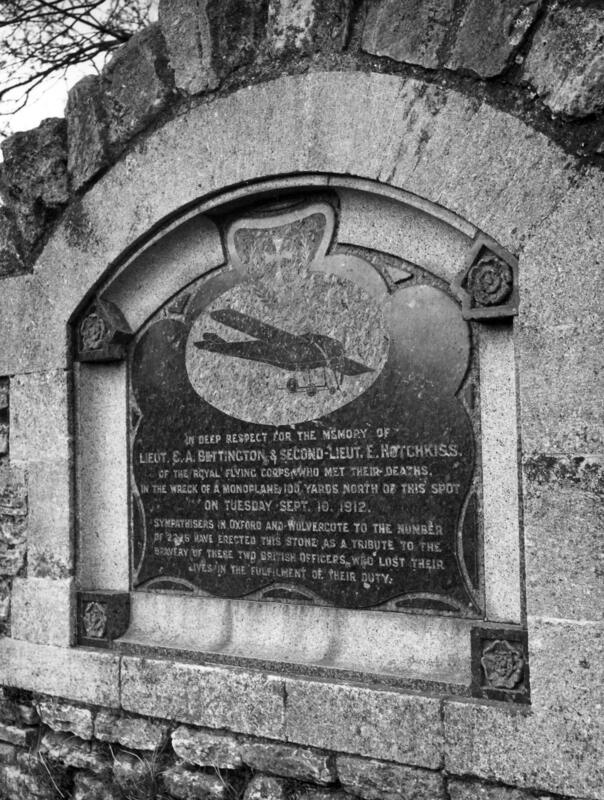 ‘FLIGHT’ 18th April 1968 carried a photograph of this memorial taken by Hastings photographer N.Woodall Esq. who kindly sent the writer a whole-plate copy of same. There is also a memorial plaque made of sheet metal taken from the crash-site in Wolvercote Parish Church. How did this early aviator (the writer believes that Lt.Bettington was the first British Service pilot to be killed “whilst carrying-out his official orders”) come to be buried at Hunmanby ? Rev. Mitford (cousin of Admiral Mitford – late Lord of the Hunmanby Manors) was the Hunmanby vicar during this period and he had three daughters and a son. The eldest, Miss Dorothy Mitford was engaged to Claude Albemarle Bettington, whose family hailed from New Zealand so upon his untimely death he was brought to Hunmanby where a full Military Funeral was performed. Interestingly, Miss Dorothy never married, spending her days looking after her father upon his retirement to the South Coast. One of her sisters married Claude Albemarle Bettington’s brother. Miss Dorothy never lost touch with the village, regularly writing to several parishioners until her death. Fuller details about the crash which killed Lt.Bettington may be found in Peter Wright’s booklet “THE ROYAL FLYING CORPS (1912-1918) in OXFORDSHIRE” £5 inc.p & p. from the author 4.Parklands,Freeland. OX7 2HX. 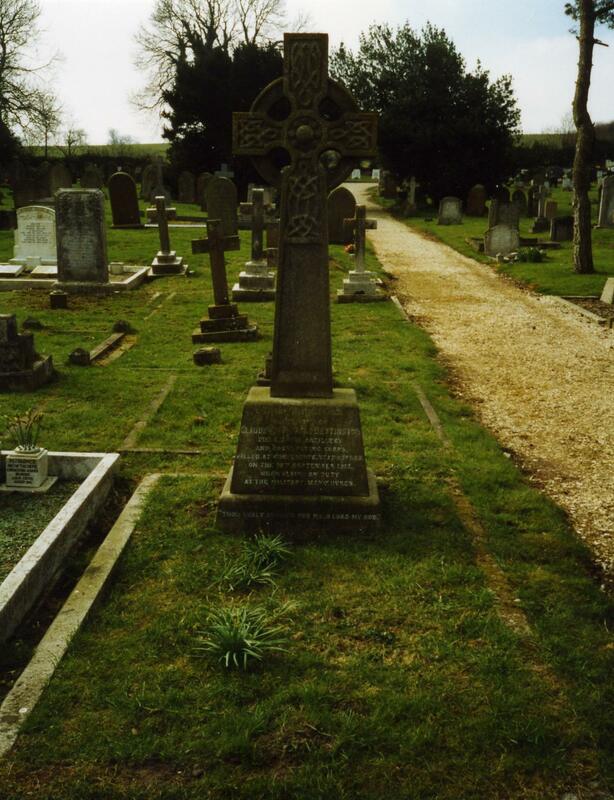 Considering the many thousands of British and Commonwealth aircrew – all volunteers – that gave their lives in two world wars and since, Hunmanby can be proud of being the burial-place of arguably, the first of these gallant men.